Christmas no longer has to be sugar-filled to feel festive, thanks to these super-tasty delights in this gift hamper. Inside you'll find all the ingredients needed for a delicious Christmas Day including rich, moist low-sugar Christmas pudding, crunchy no added sugar chocolate chip cookies and spicy ginger biscuits. Enjoy a choice of two smoked cheddar slices of cheese, crunchy oatcakes, luxury mixed nuts and a selection of finest chocolates naturally sweetened with stevia. 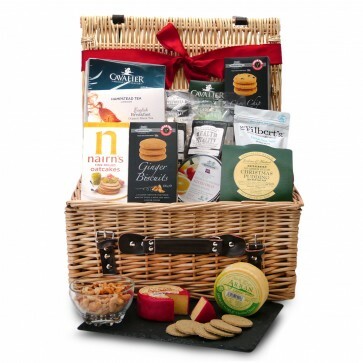 Please scroll down for a complete list of the food and drink in this hamper. Hand-packed in a vibrant pillar-box red box and decorated with a hand-tied ribbon, it can be delivered to a door of your choosing with a personalised card. The healthier Christmas alternatives in the Christmas Delights Hamper are carefully packed by hand in a gift box.